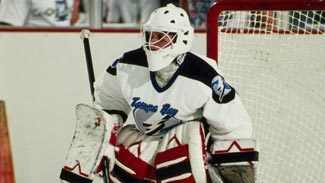 On Sept. 23, 1992, Manon Rhéaume became the first woman to play in any of the major professional North American sports leagues when she appeared for a period in an exhibition game for the Tampa Bay Lightning against the St. Louis Blues. On this 20th anniversary of her historic game, NHL.com takes a look back at one of hockey's most unforgettable moments through the eyes of people who lived it. "The way she played in training-camp scrimmages and practices, she warranted to play in a game. I don't think the Espositos would have put her in otherwise. I know everyone was nervous for her playing in an NHL game and taking that next step up. I remember coming into the rink and the Espositos were nervous because they didn't want her to be embarrassed or the organization to be embarrassed because it didn't go well in the game. They were talking about having her play in the third period or the second half of the game. I was the other goalie that night and I said, 'Just start her, don't let her sit around and ponder on the bench and sit around for two hours and then put her in. Just let her start and we'll see how it goes.' She went in and played unbelievable." "I have so much respect for [Young] because of the way he treated me. He was amazing. He was a veteran and he was someone I was looking up to. He could have just made my life miserable if he wanted to. But he helped me out a lot and was always nice to me and he never once made me feel like I didn't belong there. That was awesome." "The Expo Hall was an old fairgrounds building. This was not a hockey rink. The place was really small, but the place was packed to the gills (attendance of 8,223). It was a hot ticket to get in there, and it was very exciting. It was electrifying, it really was. It was the talk of Tampa Bay and the whole area with St. Petersburg for a week leading up to it." "We had to take a bus to the arena from our practice rink, and that bus ride was weird. It was nerve-wracking, there were so many things going through my mind. I was just trying to focus on the game, but also knowing what was going on and that there was a lot of pressure. "I remember walking into the locker room -- well, my own locker room -- and there was a big, huge bouquet of flowers. So I looked at the card and it was a radio station from Montreal that sent it and the card said, 'Good luck tonight, we're all behind you.' That was so great, it made me feel so good and it almost made me feel like, 'I'm not alone here. I have a lot of people behind me.' When you go through all that media stuff, not everyone is going to be nice and positive. There's always going to be the negative ones, and for whatever reason, they just stick with you even if it's minimal. They're the ones you remember and they bug you. So even if there weren't that many, those few were so negative and they so wanted me to fail that to have something like this just before I started was what I needed. "The walk from the locker room to the ice, I never felt anything like that. I just felt my heart pounding; I almost had a hard time breathing. But the coolest thing was that as soon as I stepped on the ice, all the pressure went away. It was almost like I stepped on the ice and I was finally where I wanted to be, where I felt comfortable. At that point, it was almost as if the thought that I was playing in an NHL game was gone." "We were kidding around in the [locker] room because, it's not like she's small, but compared to an NHL goalie she didn't take up much room in the net. So we were saying that we should try to shoot high, because when you saw her in the net you could see that both top corners were pretty open." 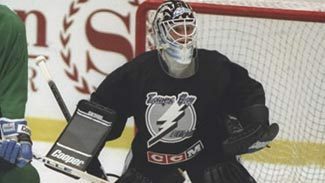 Twenty years ago, Manon Rhéaume became the first woman to play in a major-league game, appearing in goal for the Tampa Bay Lightning during the preseason. Her impact is felt to this day. "I think that it was a good story and she was obviously a talented hockey player. Anyone is a talented hockey player to be able to get to that level to even play in an exhibition game in the NHL. Certainly, there were others that maybe exploited other aspects of her other than the fact that she was just a talented goalie." "I think it was a bit of an awkward moment. It wasn't something that any of us had faced before. I thought she did pretty well. She made some nice saves, and she didn't look out of place as much as people might have expected. "There were a few jokes going around on the bench, but they stopped pretty quickly. I think we were all surprised by her performance." "The game started with a power play against us, so I'm thinking, 'OK, can it start any better?' I had three or four shots on the power play, which kind of got me into the game. So that was a good way to start the game for me." "I do remember that it was a legit goal [I scored]. It was a one-timer from the heart of the slot, I got everything on it. It was one of those goals where it was a quick play; I was shooting the puck well at that time. I think Jeff Brown scored the [first] goal and that might have been a softy, but I do remember mine was a legit goal and nobody could really blame her -- or any goalie -- for that one. It was a great pass. I was in a scoring spot. I one-timed it. I got everything on it and put it where I wanted to." "It was a great shot by Shanahan; it was a one-timer in front of the net on a quick pass. There was nothing I could do about it, it was a great goal. "But the long shot [by Brown], I was not happy with that. It was a long shot, it was a little bit outside the blue line, it hit the inside of one pad and the inside of the other pad and went in. It was just one of those fluky goals. But as upset as I was about this goal, every year when I watch the NHL it happens three, four or five times a year. It could have happened to anybody, it just so happens that it happened to me that day. But, obviously, there was so much on me that day -- I wish I had that one back." "I was absolutely nervous for her. Especially as goalies, we don't want anybody to fail. But once she got some shots against her, I settled down and I think she settled down at the same time. But then I started getting a little nervous because I had to go out and play the second period! "When I went in, I think it was 30 seconds before I let in a goal. That's how quick it happened. Pete Taglianetti was a really good buddy of mine who I played with in Pittsburgh, and he yelled from the bench 'Put the girl back in!' Then people [in the stands] were chanting 'Put the girl back in!' So I'm in my first exhibition start with the Tampa Bay Lightning, and my buddy starts a chant of 'Put the girl back in!' because I gave up a goal so quick." "Wendell being Wendell, and us being good friends, we just kind of started yelling at the coaches to put the girl back in and people picked up on it and it kind of took off from there. "I figured if we wanted a win we needed to get Wendell out of there." "So Wendell Young comes in, and he's for sure going to be the No. 1 goalie for this team, and he lets in two goals in the first nine minutes, and the crowd starts chanting 'Bring back Manon! Bring back Manon!' So I think that tells you they were on her side. "The entire Expo Hall was chanting. I mean, the entire Expo Hall. I'll never forget it. For me, being a female who was the first girl in her county to play Little League baseball and had parents yelling at me to get the girl off the field, seeing all the fans in the stands rooting for her showed that we had come a little ways in this country." "I felt very uncomfortable with that, I didn't think it was fair. I understand the crowd didn't get the whole picture, obviously we were in Tampa and nobody knew much about hockey. But I didn't feel comfortable with that because it wasn't fair for [Young]. And that's another reason I have respect for him, because as much pressure I had for that game, think about him. He's a veteran and he's playing after a girl, so he must have been under way more pressure than if he were playing after a guy. People forget that too." "I think there was a sense of relief after the game. We lost the game (6-4), but I think there was a sense of relief that this had turned out a thousand times better than we thought it would. I don't think anybody, including herself, would have thought it would have been as successful as it turned out to be." "I was just so happy that it was a tie game, that we weren't down 5-0 and every shot went in. I knew I needed to have a good performance, just for those little media who wanted me to fail, even if there were so few of them. I just didn't want to be the one failing. I refused to. So I was happy finishing the first period a 2-2 game, having faced a power play and nine shots. It was a 2-2 game. There were two NHL teams out there, I faced a power play, so I couldn't have asked for any better than that."